The fifth in the bestselling and immensely popular I HEART series following Angela’s romantic misadventures. Angela’s visa has expired and it looks as though she’s going to have to set foot again on home turf where further romantic trouble awaits. She has to face the ex-boyfriend she ran out on, her best friend’s new baby, and her mum. Is she now a New York girl through and through or can London win her heart again? The eagerly anticipated return of a much loved character is always a tricky one. The reader knows the character well therefore there is a chance that the author won’t do the character justice and let the reader down. This was NOT the case with I Heart London. Lindsey Kelk did Angela Clark proud. Opening this book was like slipping on your favourite pair of fabulous jeans, familiar and yet you knew it was going to be good. The book begins in New York and then quickly changes setting to Surrey/London where most of the story takes place. 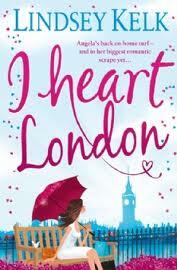 I was worried that because the story was taking place in London, we wouldn’t have some of the other much-loved characters included, but they are all there and we get to hear more from best-friend Louisa which was a welcome edition to this, sequel number four to I Heart New York. Angela gets herself into the usual scrapes and capers only this time she has to face up to her parents as well as Jenny Lopez and now Fiancée Alex. The fact that there is not an engagement to contend with adds a new dimension to this story, and I’m sure readers who have not followed Angela from the start but who can sympathise with the engaged or recently married will love this story because of this extra dimension. As in I heart New York there were some great references to British brands and British icons which seems to make the book even more apt at having been released during the Queens Diamond Jubilee. Even if you are brand new to Lindsey Kelk and Angela Clark you will love this book for its fun characters, relatable storyline and parent/grown-up child dilemmas. I heart Lindsey Kelk. I heart Angela Clark. I heart I Heart London. Oh and ‘That’ll do pig’!